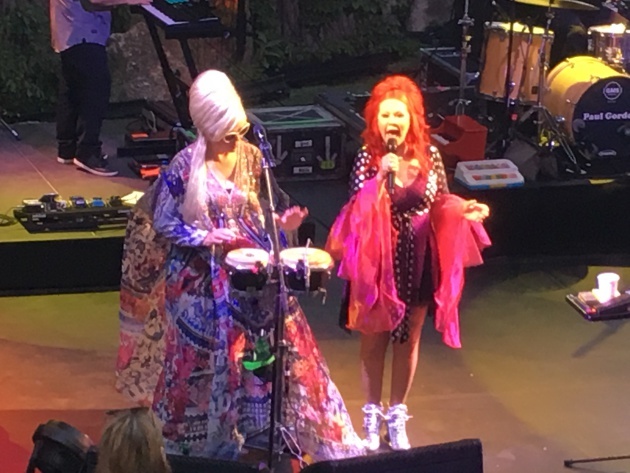 The Minnesota Zoo amphitheater was overflowing on Sunday night with people on their feet who wanted to party to the B-52’s, the enduring new-wave band. Drummer Sterling Campbell (remember him from his stint with Soul Asylum?) and bassist Tracy Wormworth (she’s played with Sting, Cyndi Lauper and others) certainly did their part, providing the dance rhythms for the SRO nostalgia-loving fans, who remembered the B-52’s from their late 1970s hits and/or their ’89 and ’90 comeback hits. 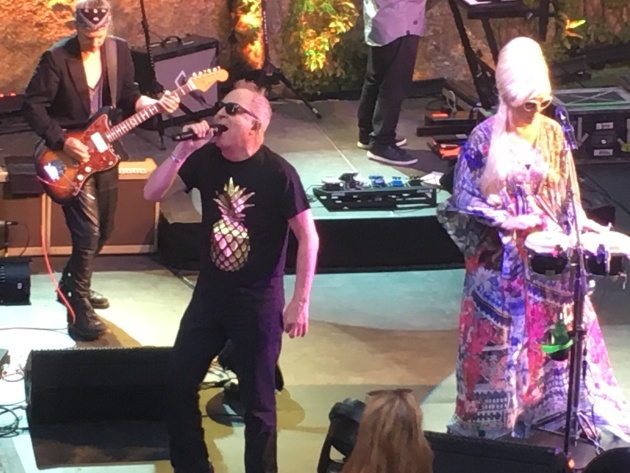 But the three longtime members of the B-52’s – vocalists Fred Schneider, Kate Pierson and Cindy Wilson – took a long time to get into gear on Sunday. Maybe Schneider (pictured below), who’s really more of a cheerleader/performance artist than a vocalist, partied too much on Saturday to celebrate his 65th birthday. He seemed somewhat blasé in the early going on “Cosmic Thing,” “Lava” and “Funplex,” the title track from the group’s last album, in 2008. He lacked his usual sense of fun, kitsch and irony. Wilson, 60, was not in great voice all night but she mostly sang harmonies. Pierson, 69, tried to ignite things but she wasn’t always as fiery as her screaming red wig. While the punkish “Private Idaho” (1980) connected, “Roam,” the huge 1990 hit, seemed aimless (and Fred-less, since he wasn’t onstage). Finally, things turned around on “Channel Z” with its heavy beat and Pierson’s squeaky caricature of a voice. “Love Shack,” that 1989 rebound smash, actually had melody (unlike all the band’s early DIY new-wave tunes) plus some weird guitar effects (guitarist Keith Strickland no longer tours with the band). It was easily the most musical song in the 80-minute set. For the encore, Schneider traveled to “Planet Claire” (1979) with enthusiasm as Pierson seduced with wordless vocalizing. Then Schneider went full-on punk for “6060-842” (1978) and into vintage feigned freneticism for “Rock Lobster,” the 1978 classic during which Pierson’s voice careened like a pinball en route to a free game. The bouncy nostalgic fun in the second half compensated for the less buoyant first half – and even made up for Schneider and Pierson remembering their early Minneapolis appearances at the “Horseshoe” bar, which was actually the Longhorn.